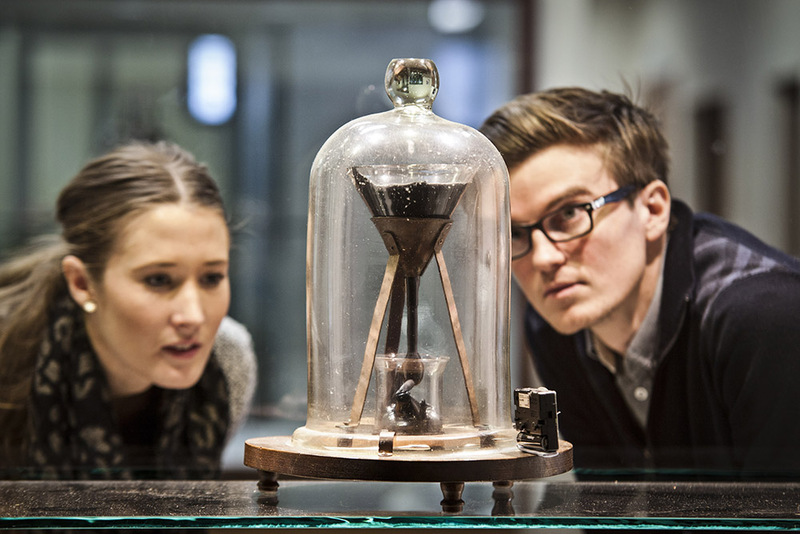 To date, only nine drops have fallen in our famous Pitch Drop experiment. We're home to the famous Pitch Drop experiment, which holds the Guinness World Record for the longest-running laboratory experiment. The experiment demonstrates the fluidity and high viscosity of pitch, a derivative of tar that is the world's thickest known fluid and was once used for waterproofing boats. Thomas Parnell, UQ's first Professor of Physics, created the experiment in 1927 to illustrate that everyday materials can exhibit quite surprising properties. At room temperature pitch feels solid - even brittle - and can easily be shattered with a hammer. But, in fact, at room temperature the substance - which is 100 billion times more viscous than water - is actually fluid. In 1927 Professor Parnell heated a sample of pitch and poured it into a glass funnel with a sealed stem. He allowed the pitch to cool and settle for three years, and then in 1930 he cut the funnel's stem. Since then, the pitch has slowly dripped out of the funnel - so slowly that it took eight years for the first drop to fall, and more than 40 years for another five to follow. Now, 87 years after the funnel was cut, only nine drops have fallen - the last drop fell in April 2014 and we expect the next one to fall sometime in the 2020s. The experiment was set up as a demonstration and is not kept under special environmental conditions - it's kept in a display cabinet - so the rate of flow of the pitch varies with seasonal changes in temperature. The late Professor John Mainstone became the experiment's second custodian in 1961. He looked after the experiment for 52 years but, like his predecessor Professor Parnell, he passed away before seeing a drop fall. In the 86 years that the pitch has been dripping, various glitches have prevented anyone from seeing a drop fall. To see the experiment for yourself, view the physical set-up in its display case in the foyer of the Parnell Building (Building 7). Alternatively, you can watch the experiment's live video stream. More than 35,000 people from some 160 countries are registered to view the stream. Professor Andrew White is the Pitch Drop's third and current custodian. Email your Pitch Drop enquiry to pitchdrop@uq.edu.au.